The all-new 2019 Mazda3 five-door and sedan will arrive at dealers in March. Notable for the new generation is available all-wheel drive on both body styles. For the new year, Mazda is offering every trim with the 2.5-liter (non-turbo) Skyactive G engine. The engine produces a generous 186hp and also 186 lb-ft of torque. We have driven that engine in the Mazda3 previously and it is more than enough power to spin the wheels in the first three gears. The manual transmission is still available, but only on the middle trim of the five-door hatchback. The 2019 Mazda3 will also be the first Mazda3 with both Apple CarPlay and Android Auto. This infotainment technology will separate the Mazda3 from rivals like the BMW X2, Toyota Corolla Hatchback, and other brands that only offer Apple CarPlay. The AWD system of the Mazda3 further helps to separate the car from the Hyundai Elantra line, which only has front wheel drive. Few of Mazda's peers now offer such a complete package. Preferred trims offer upgrades such as Bose Premium audio, heated front power seats, and SatRad. Premium trims are available with AWD and feature leather seating, a head-up display, active (swiveling from side to side) headlights, and a power moonroof. Fuel economy data is not yet available. We will update our coverage when it becomes available. Expect about 31 MPG combined. Good power, a 6-speed auto transmission – rather than a CVT, all-wheel drive, hatchback, and Android, certainly makes for an attractive package in this market segment. Probably the best choice – time for a test drive. Addendum: Dreaming – Mazda make available the turbocharged engine (250hp) in the 3, for a true pocket rocket. Actually spinning the wheels in 3rd gear with 186HP sounds like a worrisome traction problem. No wonder why they are offering AWD. 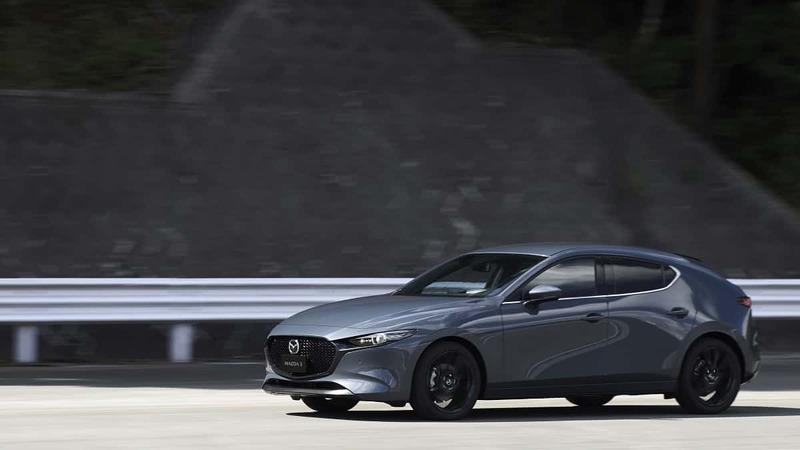 The new Mazda 3 looks nice, and appears to be a good deal, but my mind also goes to a future 250HP+ MazdaSpeed version, along with a similarly powered MazdaSpeed Miata. It is interesting that the AWD version of the new Mazda 3 is only available with the automatic transmission.